* City: Detroit; * County: Wayne; * No. : 389 Cass Ave.
* Name of Father: Jas. Smith * Birthplace of Father: Mass. 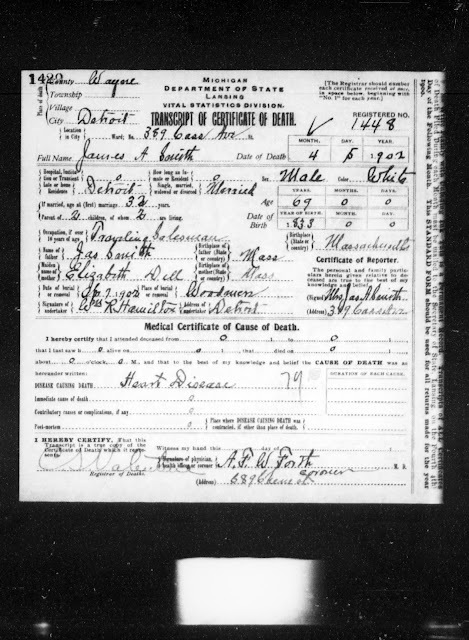 * Maiden Name of Mother: Elizabeth Dill * Birthplace of Mother: Mass. * Informant: Mrs. Jas. A. Smith * Address: 389 Cass Ave.
"Death Records, 1897-1920," online database, Seeking Michigan (http://seekingmichigan.org/), Transcript of Certificate of Death, Wayne County, 1902, No. 1448, James A. Smith entry (http://seekingmichigan.contentdm.oclc.org/cdm/singleitem/collection/p129401coll7/id/488832/rec/6). James A. Smith is the son of my third great-grandparents, Alpheus and Elizabeth (Dill) Smith, and the brother of my 2nd great-grandmother Lucretia Smith (1828-1884). He married Annie Eliza Stewart in 1864, and they had two daughters, Annie Lucretia Smith (1864-????) and Grace Louisa Smith (1866-1959). The two daughters are my first cousin three times removed. The only obvious error in this record is the name of the father - it should be Alpheus Smith, not James Smith. The informant surely had never met her father-in-law and may have forgotten or not known his name.